Turin, Italy the 3rd of January 1889 Fredrick Nietzsche was moved to tears by a cab driver who was whipping his horse because of its stubbornness. Nietzsche threw his arms around the horse and begged the cab driver to stop. Soon, after this Nietzsche passed out and slept for two days. 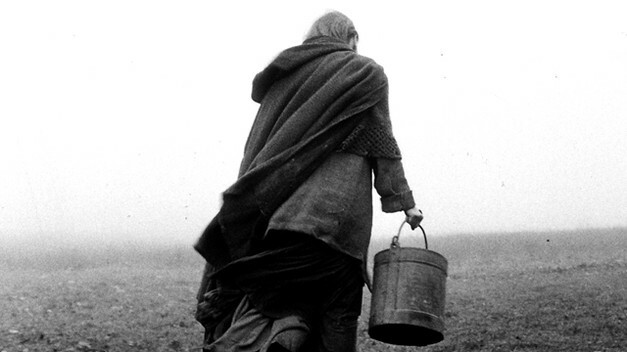 This is the starting point of Bela Tarr’s new film The Turin Horse (2011). The film opens with a narrator narrating the above moment of Nietzsche’s life. The opening shot of the film is the cab driver and the horse going home. This opening scene reminds me of Nikolia Gogol’s Dead Souls (1842). At the end, of the first part, of the novel Chichikov the main character is driving a horse drawn wagon full of dead souls, which are dead serfs. In the book, the horse drawn wagon represents Russia. The question is, where is this wagon going? In The Turin Horse the cab driver with his horse, I believe, represents humanity; so the question is where is humanity going? The answer is nowhere. This is fuller reiterated when the cab driver and his daughter pack up their belongings to leave their house. They pack the wagon and hitch the horse. Only travel for a short time and come back to the house because there is nowhere to go. The structure of the film consists of 6 days. This can be considered a reverse of the creation narrative[*]. Chronicling in detail the moment-to-moment life of the two characters waking up, fetching water, eating and menial chores. The repetitive structure of the film suggests the heaviness of existence posed by Martin Heidegger. Also because of the monotony of this film small changes in the daily routine have a huge weight of significance*. The repetitiveness also shows how people wake up from day to day yet nothing gets better. The bleakness of this film bears a likeness to the play write Samuel Beckett. * The land the two characters inhabit is desolate, with a storm blowing around. This gives the earth a harsh quality. To give some better perspective to the bleakness, I suggest this film makes The Seventh Seal (Bergman, 1957) look like It’s A Wonderful Life (Capra, 1947). Tarr gives the viewer a world that is off kilter, and poses no solution to regain a world distorted. Bela Tarr is a contemporary of Andrei Tarkovsky. The movie is filmed in long delicately composed takes as opposed to quick edits. The first line of the film does not come until 25 minutes into the film. This film is for those with an acquired taste for the filmmakers of Andrei Tarkovsky, Ingmar Bergman, Krzysztof Kieslowski, or Terrance Malick. This film is not to be just viewed but experienced, which is why I feel this review does not do justice to the movie.